����������� First: SJPCC Newsletter Note: Post card club newsletter editors may copy all or part of this article for use in any club publication. Lockkeeper requests that you notify ray@lockkeeper.com of any intention to use this article and please, ascribe the article to the original author. ����������� On the list of the truly beautiful people in history are three women who lived a grand lifestyle, but also had a common and terrible final experience. These three women were people most of us could only have known from the media, but they were women who had that special charisma that commands respect and admiration. One was a person successful in uniting two distinctly different European nations in a time when differences in social and economic conditions made it nearly impossible to achieve any kind of tolerance or understanding. Another was a world class actress who entertained her audiences in award winning motion pictures, and later, along with her handsome and dashing fiancé, fascinated the world as they married on an international stage. The third was a young lady who was introduced, to the public by her prince charming, in front of news cameras from around the world. Life sometimes troubled her, but she matured into a woman of international stature, who was respected for her philanthropic work and her interest in the well being of all mankind. ����������� The young lady, of course, was Diana Spencer - Lady Di - Diana, Princess of Wales - Diana. ����������� The actress was Grace Patricia Kelly - Grace Grimaldi - Princess Grace - Grace. ����������� The last member of this trio was a beautiful and confident young women who is likely not remembered by very many people today, she was Astrid Sophie Louise, Princess of Sweden - Astrid, Queen of the Belgians - Astrid. ����������� Each of these women were royal. Each were special to millions of people for many different reasons, and each shared a dreadful final experience - they died in automobile accidents in foreign countries. ����������� Princess Diana of Wales. Nearly everyone knows about the events of Saturday, August 31, 1997, when Diana, her friend and their driver were killed in an automobile accident in Paris. Her death was a tragic shock to a world that loved or admired her and appreciated her charity work. She left behind an ex-husband and two young boys, William and Harry, who will someday in the future, play a dynamic roll in the history of their country. ����������� Princess Grace of Monaco. Monday, September 13, 1982 seems not too long ago for many people but it is truly a lifetime for millions of modern teenagers. On that day, just two months before her fifty-third birthday, Grace, Princess of Monaco, was driving with her daughter, along a winding road in southern France. Apparently because of a minor stroke, Grace lost control of her vehicle and ran off the road and down an embankment. Grace died the next day of the injuries she sustained in the accident. ����������� Astrid, Queen of Belgium. August 29, 1935, almost a life time ago, the first of these tragic deaths happened on a beautiful Thursday morning in Switzerland. King Leopold III of Belgium and his queen, Astrid, were out for a ride in the sunshine after a week of rainy and dismal weather. The king had owned an American made sport car for less than a month and on the last day of their summer holiday along the shore of Lake Lucerne, near a small village named Kussnacht, their car went through a break in the curb, hit two trees, then rolled into eighteen inches of water. Astrid, sitting in the passenger's seat, sustained a fractured skull and died in the arms of her husband just minutes after the accident. 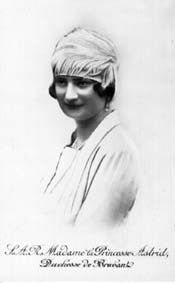 ����������� Life for Astrid Sophie Louise began on November 17, 1905, in Sweden. Her parents, Prince Charles (brother of the king of Sweden) and Princess Ingeborg (sister of the king of Denmark), reported raised Astrid in a fashion typical of children in average upper-middle class Swedish families. She was the third of four children. Along with her older sisters Margaretha and Martha, Astrid attended high school and had private instruction in domestic skills. Margaretha, later in life married Prince Axel of Denmark, and Martha, was, until her death in 1954, the Crown Princess of Norway. Astrid's only brother, Carl Gustaf Oscar, Prince of Sweden, will soon celebrate his ninetieth birthday. Like most royal children in Scandinavia the daughters and son of Charles and Ingeborg were brought up in the Lutheran church, educated and trained to serve the people of their country. 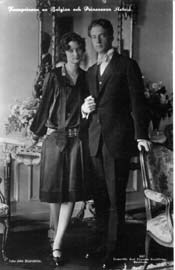 ����������� Late in 1925, rumors started to circulate about Astrid's engagement-to-marry. The Prince of Wales was often spoken of as the likely future husband of the Swedish princess, but on September 21, 1926, it was the Belgian king, Albert I, who announced Astrid's engagement to his son, the Crown Prince, Leopold III. The courtship had been completely private - it is known for sure that there were many covert visits to the Swedish capital undertaken by the Belgian Prince. He traveled third class and carried his own luggage in order to avoid publicity and notice. In the engagement announcement the queen - Elizabeth of Bavaria - Albert's wife, made it known that this was a love-match and that the two young people were acting with complete liberty and independence without interference from anybody. ����������� The royal couple were married in two different ceremonies, the first being on November 4, 1926, in the throne room of the royal palace in Stockholm, the day after Leopold's twenty-fifth birthday. The official church wedding happened in Brussels on the tenth of November, 1926, with the kings of Sweden, Belgium, Norway and Denmark present. Along with the official United States ambassador to Belgium, several hundred invited family, guests and dignitaries saw the bride and groom, amid scenes of jubilation and pomp, exchange their vows in the cathedral of Sainte-Gudule. Wedding pictures of the royal couple show the twenty year old bride in a white flowing gown, with a floor length train, that would have been the envy of any bride of that era. ����������� Astrid soon felt completely at home in her new country. Stories about the new princess were well circulated by newspapers and retold by word-of-mouth. Such tales made Astrid a much beloved public personality nearly overnight. The happening that prompted such a story, which today would seem like a total non-event, took place on the day before Leopold's and Astrid's first wedding ceremony. It was Leopold's birthday. He was in Stockholm for the ceremony the next morning, and naturally, was present in the palace for a birthday dinner-party. After dinner, Princess Astrid presented the Crown Prince with a birthday cake that she had baked herself. It was a chocolate frosted birthday cake. Frosting made with Belgian chocolate. ����������� On February 17, 1934, Leopold's father, Albert I, king of the Belgians died as the result of a fall while mountain climbing on Marche-les-Dames, near Namur. He was only 59, and his death sent the Belgian people into a state of deep mourning. Leopold and Astrid learned of the king's death while traveling in Switzerland. 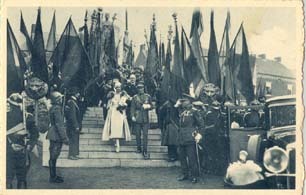 They returned to Brussels immediately and Leopold became king on February 23, 1934. The start of their reign as king and queen of the Belgians began with Queen Astrid and her two elder children (Princess Josephine Charlotte and Prince Baudoin) sitting on the dais, dressed in mourning clothes, and the Queen Mother Elizabeth sitting opposite her son as the oath was administered by government authorities. Sad times indeed. ����������� Another story that brings a smile to modern faces is the fact that Astrid insisted on pushing her own baby carriage. On June 6, 1934, just three months after becoming queen of the Belgians, Astrid gave birth to the third of their children - Albert, Prince of Liege - the present king of Belgium. There are many photographs of the Queen, on the grounds of the palace in Brussels, with her children, and the fact that she would maneuver a hundred pound baby carriage around the streets of Brussels caused the burghers of the city much satisfaction. ����������� During those early months of the king's reign, he too was often seen with the Queen and his children around the city of Brussels. The king was by tradition the commander-in-chief of the Belgian army, and he was usually seen wearing a khaki uniform, the same as his troops would have worn at any given time. His role as a leader of the army would be one that would come to haunt him in later years. ����������� Leopold was an avid and daring sportsman, much like his father, and the queen and their children would often accompany him on automobile and sailing trips. Astrid, too was an enthusiastic sportswoman. As a young girl in Sweden, she had learned to ski and toboggan on her father's estate in Vestergoetland. She was also a very accomplished tennis player - a skill she learned from her uncle Gustaf V, the king of Sweden. ����������� These were good times for the Belgian royal family and the people of their country. Most of the social problems that plagued the Belgians for years were solved by constitutional agreement. The Flemings and Waloons each had achieved their goal of making Belgium a bilingual country. The only problem was that the economic crisis that gripped America in a strangle hold of depression also engulfed parts of Europe. Little did the people of Belgium know that just over a year from those days in the spring of 1934, their whole world would again be changed by the terrible death of a member of their royal family. ����������� The news no Belgian wanted to hear came in the evening of August 29, 1935. Astrid was dead. Killed in an automobile accident along the shore of Lake Lucerne in Switzerland. She was 29 years old. ����������� It happened at 9:14 AM. The king was driving along a half-mile straight-away that was a well asphalted, two-lane highway. It seemed from the condition of the car after the accident, that the king couldn't have been driving much more than thirty miles per hour at the time of the crash, and as witnesses recounted the event, everyone felt that the accident was nothing more than incredible bad luck. The road edge was lined by an eight inch concrete curb with eighteen inch drainage gaps every fifty feet. Beyond the curb the ground, covered by smooth grass, sloped about thirty degrees to the lake fifty feet away. ����������� Apparently the royal car's right wheel left the road in one of those drainage apertures and continued some ninety-five feet straddling the curb but with the right side of the car some three feet below the level of the left wheels. At that place the car came to a pear tree about ten inches in diameter and about the width of a car distant from the highway. The two-seater coupe struck the tree with the upper center of the right door exactly where the queen was riding as passenger. The jolt threw the queen from her seat, hitting her head against the tree in the process. She died minutes later. ����������� Doctors who performed a hurried autopsy late that Thursday afternoon identified the injury that caused the queen's death as a fractured skull. According to the nurse who prepared the body for burial, except for the injury to her forehead, Astrid's face suffered almost no other disfigurement except for a slight bruise under her chin. ����������� At 10:15 PM, in the Lucerne railroad yard, two funeral cars were added to the train that travels regularly between Milan and Brussels. Astrid's body, in a plain oak coffin, was placed in a baggage car that was quickly turned into a chapel. She was accompanied by two Catholic nuns. The king and his party were alone in the last car. As the funeral train crossed the Belgian frontier, the church bells in the nearest village began to toll in mourning and as the train progressed the tolling was taken up in the next village. After the train arrived in Brussels on Saturday morning, a simple black and silver hearse took the coffin from the train to the palace where the dead queen's body was removed and placed on a bed of white silk, covered with flowers and strewn with violets. Thousands of Belgians, of all stations in life, entered the Thinker's Hall of the palace and filed by to catch a glimpse of Astrid's pale, bandaged face. Only her face was visible to the visitors. The forehead and right cheek were covered with bandages giving her the appearance of a wartime nurse at rest. ����������� The funeral services, held the following Tuesday, brought the people of Belgium to the streets of Brussels. Still stunned by the magnitude of the tragic event that had befallen them, the mourners wept openly in the streets for their queen. The bells of Sainte-Gudule, which rang for the royal marriage only nine years before, now tolled slowly and dismally. Crowds of people stood silently and bareheaded to watch and listen for the funeral procession to the burial site in Laeken, Belgium. Flags were at half-staff everywhere. There was an endless steam of people who made their way to the palace to express their sympathy. ����������� The fame and fortune of royal families and governments are at best fleeting and this story does not end with the death of Queen Astrid. 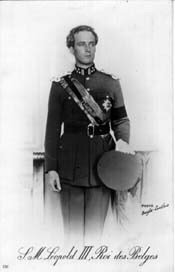 Leopold III continued as King of the Belgians for another sixteen years, but in the end was forced to abdicate his throne because of his actions on behalf of the Belgian people during World War II. He died in exile in 1983. Baudoin I, Astrid's oldest son took the crown from his father in 1951 and wore it proudly until his death in 1993. 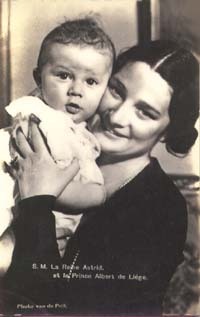 Baudoin had no heirs, so today Albert II, Astrid's second son, who was born that happy summer of 1934, is now king, thus making Astrid the mother of two Belgian kings. ����������� On the night of the accident, in a radio address, the Belgian Premier Paul van Zeeland, told his nation, "Our queen is no more. We have lost her only for a few hours, but already the greatness of the void she left has caused a deep impression of anguish and consternation. It was hardly nine years ago that she came to us, like a fairy princess in an atmosphere of grace, love, youth and happiness. Who would not have envied her - beloved Queen, gifted woman, mother of three fine children? Yet a single moment was enough for a tragic accident to sweep away everything - both the reality of the present and the promises of the future. Is there really some mysterious law that insures that everything that is the greatest, the purest, the most beautiful should last only for a short time?" 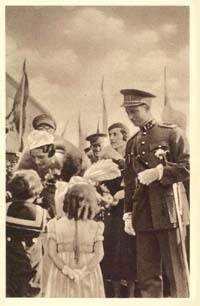 Astrid with her husband, King Leopold at the dedication of an Old Soldier's Monument in Borinage. 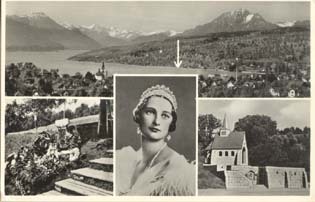 Multi-view card: top, arrow shows lakeside location of the accident; bottom-left, flowers adorn the much visited scene; center, Queen Astrid (official 1934 portrait); and right, the Chapel of Remembrance for Astrid, Queen of the Belgians.